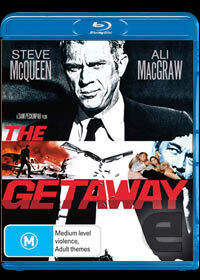 Warner continue to release some classic movies on Blu-ray and this time around, it's the original 1972 The Getaway that stars the legendary Steve McQueen and the beautiful Ali MacGraw. Unlike the 1994 remake with Kim Basinger and Alex Baldwin, the original is a far more substantial film thanks to director Sam Peckinpah and when originally released, it caused some controversial due to the violent nature of its concept. In The Getaway, Steve McQueen plays a convicted bank robber whose wife seductively makes a deal with a politician in order for him to be released from prison with a catch that he will receive a percentage of their next robbery. Unfortunately as fate would dictate, the robbery goes awry and the couple are forced to flee to Mexico as they are chased by a group of individuals who want their blood. The movie was quite unique for its time and featured some great classic Hollywood scenes such as the action scene on the train, however I must admit that unfortunately The Getaway has dated a little since its conception due to the fact that many films have "copied" this premise and the powerful message seems to have been lost in time. If you're a fan of classic Hollywood films or Steve McQueen, than this is the movie for you, however for the majority of viewers, they may want to seek their enjoyment elsewhere. The movie is presented in widescreen 16:9 with Dolby Digital 1.0 Audio. The video quality has been improved and looks quite impressive on Blu-ray for a film of this caliber, however it's a shame that the audio sounds a little flat. Needless to say, The Getaway is still a classic movie and could be the considered the archetype of many modern crime films.